‘European Eyes on Japan’ is the title of a project that invites photographers from all over Europe every year to document their view of Japan. This year an Austrian, Andrew Phelps, is among the four chosen artists. 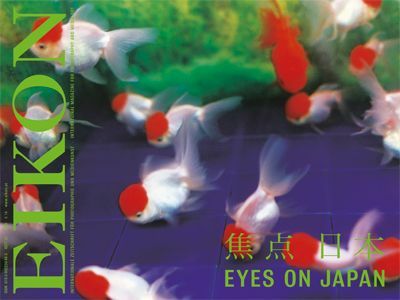 You will find a selection of his works and of his characteristic vision in this 67th issue of EIKON, which uses the Austria-Japan Year 2009 as a pretext for taking a look at the artistic practices of our Asian partner country. Our partner in this project is the Foreign Ministry of Austria, whose extensive support has made the production of this compendium possible. For the selection of the contributions on this theme, our particular thanks go to Ferdinand Brüggemann, a specialist in Japanese photographic art, whose consultation has enabled us to bring together prestigious authors in this special issue. A long-term exchange between Austria and Japan has taken place in the media art sector in particular. We have been able to persuade David d’Heilley to engage critically with the development of this much-discussed art form and to explain why, in his opinion, Japanese media art is stuck in a crisis. Mariko Takeuchi, guest curator of the Japanese special section at the Paris Photo 2008, makes historical links visible and illustrates the current tendencies and interests of a young generation of photographers by means of a selection of outstanding works. Publications, and in particular the photobook, play one of the most important roles in Japanese photography. Fresh on the market is a volume published by Aperture, which investigates the history of the Japanese photobook from the 1950s to the 1970s. Naoko Kaltschmidt spoke to the author of this book, Ivan Vartanian, and summarised the conversation for EIKON. The fact that the proportion of women in the Japanese art business has risen in the last 15 years from approx. 10 percent to over 50 percent has prompted Michiko Kasahara, Chief Curator at the Tokyo Metropolitan Museum of Photography, to examine issues surrounding gender roles in Japanese society. She shows our readers her investigations by means of selected female photographers. In another essay, we pursue the question of what the training situation is for prospective photographers, and have commissioned Mika Kobayashi to pursue this issue in her own country. The Forum is this time dedicated entirely to the relationship between Austria and Japan. Among others, Ursula Hentschläger reports on Japanese projects at this year’s Ars Electronica Festival in Linz, while Patricia Grzonka has visited the Coded Cultures Festival in Vienna for EIKON, which will be continued in October in Yokohama. Even the Art market is this time entirely under the ‘rising sun’. We have invited Edgar Honetschläger, to whom EIKON recently dedicated a comprehensive main contribution, to be our guest commentator. His views as an Austrian who has chosen to live in Japan can be found right at the beginning of this issue, and parallel to that in the current exhibition in our display window, the EIKON SchAUfenster: the location in the Vienna Museumsquartier where EIKON draws attention to its print issues. Directly next door Asifa Austria, the platform for innovative animation films, was showing a Video work by Maya Yonesho this summer. The Japanese artist began her ‘hitchhike’ three years ago in Vienna. Extracts from ‘Wiener Wuast’ and ‘Kyoto Mix’ can be found on pages 6 and 7, as well as here beneath this text.